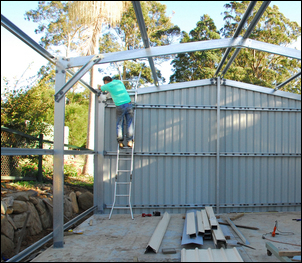 Last week in Part 3 we showed the singlehanded errection of the framework for a 14 x 6 x 3 metre shed that will become my new home workshop. This week it’s time to put on the cladding – something that sounds really easy, right? With the framework erected, all that is required to clad the walls is to place the sheets of Colourbond vertically against the wall framework then, using the supplied Teks, screw them to the frame. Arrange ladder inside shed, resting against the eave purlin at the location of the sheet to be worked on. Place vice grip clamp high on ladder. 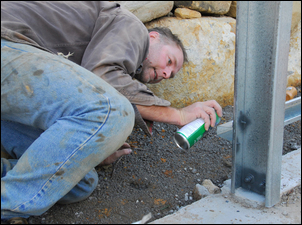 Place 1 metre long heavy steel beam against outside wall of shed, adjacent to the sheet location. Place electric drill within easy reach from outside the shed. Place timber packing on ground to roughly set the correct sheet height. Collect sheet, rest on timber and then lean against shed frame. Prop sheet into position with heavy steel beam. Reach top of ladder, collecting vice-grip clamp along the way. Look over top of wall and assess level of sheet (needs to be flush with top of eave purlin). Pull sheet upwards to correct position and clamp with vicegrips. Descend ladder and step outside shed framework. Use bubble level to check that sheet is vertical. 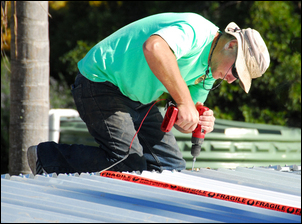 Push sheet against shed framework and use electric drill to insert one Tek screw. Climb ladder and check sheet height again. Insert top Tek screws. Descend ladder and measure position of bottom and middle girt screws. Insert these screws (total of screws – 18). Move ladder, drill, steel prop beam and timbers to next location. Repeat above. I didn’t ever time how long it took to do each sheet, but it was considerable. For the end walls, where the sheets had to be positioned (as per steps 1 – 7 above), marked and then taken down again to be cut at the correct angle, before the whole installation process was again undertaken, the time doubled. In fact, while erecting the complete framework took me 3 days, doing the wall cladding alone took 4.5 days. That time included adding the trim pieces at each corner and around the two front roller door openings. These trim pieces were pop riveted into place. The gutters clip into brackets that are attached to the wall sheeting. The instructions for the shed said to use Tek screws to attach these brackets, but the ‘bite’ of a Tek screw into very thin sheeting seemed to me to be poor design so I pop-riveted the brackets into place, using two large pop rivets for each bracket. The brackets were placed at roughly 1 metre intervals. A downhill slope was provided by mounting the brackets at slightly lower heights in sequence towards the downpipes. During installation the gutters needed to be clipped into the brackets (easy!) and, where the 3.6 metre lengths joined, ‘nested’ into one another (not so easy!). These joins were secured with pop rivets and sealed with silicone. The openings for the downpipes were made with a metal nibbler and the downpipe adaptors siliconed and riveted into place. End caps for the gutters were held in place in the same way. 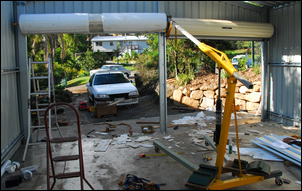 I found the installation of the gutters fiddly and time-consuming – to install the 28 metres of gutter took 1.5 days. 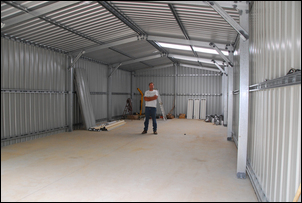 I chose in most cases to use more screws to hold the wall and roof sheets in place than were specified. This shed design gets a lot of its strength from the cladding – in effect, the shed is a stressed skin structure. This could be most easily seen by grabbing the bare, erected frame and shaking it. 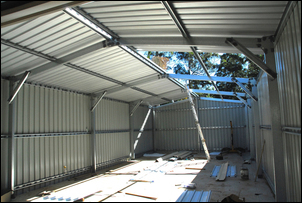 Despite being bolted to the concrete slab, and despite the presence of diagonal knee braces that join the columns to the rafters of the middle three frames, the frame of the shed could be quite easily flexed in all directions. 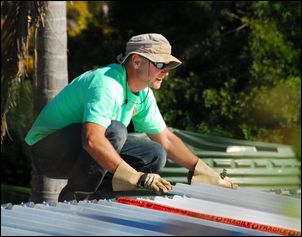 However, start to add sheets of cladding to the walls and roof, and the structure immediately stiffened. Clearly, then, the better the cladding is attached to the frame, the better the stiffness (and overall strength) of the structure. Tek screws are cheap and the additional few hours it took to insert the extra screws seemed trivial in the overall scheme of things. Cladding the roof was also more difficult than it first appeared. The problem wasn’t in singlehandedly getting the sheets onto the roof – in fact, this was straightforward. What I did was to place a rug on the gutter, lean a sheet against it, and then climb on top of my ~1 metre retaining wall and slide the sheet onto the roof. Nope, the main problem was to stop the sheets ‘fanning’ as they were screwed into place. This needs a bit of explanation. 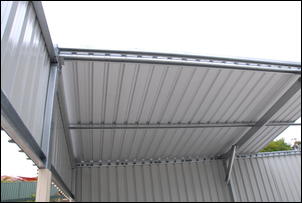 The roof sheets overlap along their edge, and as they’re put into position you’d expect that they would remain parallel to each other and at 90 degrees to the long axis of the roof. However, what invariably happens is that they start to ‘fan’: to spread out more at one end than the other. But surely to stop this fanning all it needs is a bit of care? That’s what I initially thought but when, no matter how careful I was, the fanning occurred, it was time to stop and think. And then I got it – the reason that fanning was occurring. Unlike the wall sheets, that are held in place with screws inserted through the ‘valleys’ of the sheets, the screws on the roof sheets are inserted through the ‘peaks’. As these screws are tightened, the ‘peaks’ get squeezed a little, and if the screws are inserted from (say) left to right, the sheets can in fact get wider at that end than the other. And, the closer these screws are positioned to the end of the sheet, the more likely that fanning at that end will occur. Once I’d worked out why it was occurring, it was easy to address. If I wanted one end of the sheet to spread a little (ie to correct fanning occurring at the other end), I’d insert the screws in sequence to cause the slight spread. If I didn’t want any spread to occur, I’d put in the last screw first and then work back towards the already installed sheets. Very small corrections could then be easily made, keeping the sheets parallel and at right-angle to the walls. The other problem I had was in denting the sheets. When I’d bought the shed, I’d asked the supplier if it was fine to walk on the roof. “Sure” he’d said confidently, just adding that you needed to walk in the valleys rather than on the narrow peaks of each sheet. When he’d delivered the roller doors and screws, he’d added a further point – be very careful when turning around that the heel of a foot didn’t put extra weight on the peaks. Maybe the fact that he was fairly small and light man had something to do with it – I dented a sheet within moments of walking on the roof. 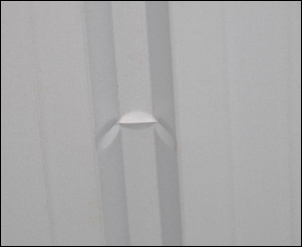 Furthermore, despite taking enormous care, during the installation of the roof sheets, I put in another two dents! I weigh about 90kg and I kid you not, less than a quarter of that weight placed incorrectly caused a crimp in a sheet. To check for fanning and to mark the locations of the upper screws, I made a simple wooden gauge. This improved accuracy and speeded installation up a lot. Installing the roof cladding took me 2.5 days, not including trim prices like the roof capping. 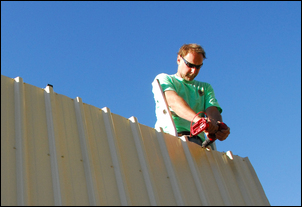 I didn’t wear gloves when installing the wall cladding and the gutters, and had no problems. But the roof sheeting proved to have much sharper edges – on the first day, I sliced my hand in three places. After that, I wore thin leather gloves when carrying and positioned the sheeting, taking the gloves off when doing other tasks. The roller doors came with their own instructions – and looked quite straightforward. But again, as a beginner, I found their installation complex and time-consuming. Here are two examples of the difficulties I experienced. When I did the wall cladding, I installed the trim bits around the door opening. But, to install the doors, all these trim pieces had to come off again! Installing a 2.7 x 2.2 metre roller door normally requires two people, but again I did it by myself. I used my engine crane equipped with the jib extension to lift one end of the door, while I manually lifted the other. This process worked quite well. It took about 1.5 days to install the two doors. 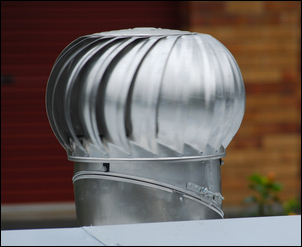 The roof capping and whirligigs (rotating ventilators) were installed next. These were (once again!) straightforward but fiddly, the roof capping requiring cutting with snips to accommodate each ridge in the roof sheets. The holes for the whirligigs were cut with a power nibbler. Finally, the end trim pieces that cover the gap between the top of the walls and roof sheets were installed. Doing these tasks took 1.5 days. After looking at commercially available – and expensive – battery-powered and mains-powered electric drills, I decided to rig up by own. It was initially going to be used to just insert all the cladding Tek screws, but in the end I also used it to drill holes for the installation of the roller doors and pop rivets on the trim pieces. The drill consisted of an old cordless drill (salvaged from the tip minus the battery), a length of twin core cable, and two 12V sealed lead acid (SLA) batteries salvaged from a PC uninterupptable power supply (also from the tip). The batteries were wired in series, providing a nominal 24V to the 18V rated drill. This system worked very well but I found that over time, the internal wires adjacent to the variable trigger switch frayed and then burnt out. Since I found myself only ever using the drill at full power, I replaced the variable trigger with a high current microswitch that I’d previously salvaged from a photocopier (they’re used in photocopiers as safety switches to detect when the machine is open). This drill worked extremely well – powerful, very lightweight in the hand, safe (no mains power cords over sharp edges) and durable (I charged the batteries just twice in the whole construction!). So after 14.5 days of work (spread over 3 weeks) the shed was finished. So was I exultant? Well, not really. More like: relieved! To be completely honest, I was happy for about the first 10 days of work, but after that I got bored and irritated. 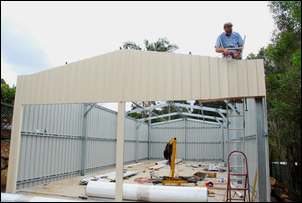 It was all the fiddly stuff that was tedious – the gutters, trim pieces, roof capping and whirligigs. These seemed to take forever and were easy to stuff up. However, here’s something to think about. 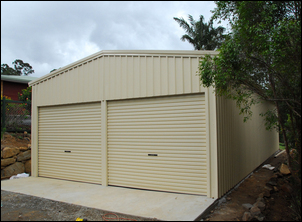 The professional errection of the shed was going to cost AUD$3650. By doing it myself, I was effectively being paid $252 a day! And I’ll tell you something else. I actually debated whether or not to include these aspects in the series – but it’s being done because it’s required, not because I like organising downpipes and drains... So, next week – downpipes, drains and a council inspection!